Tuxedo Rentals NJ - we carry all tuxedos in stock from Ike Behar, Perry Ellis, Ike Behar Slim, Jean Yves, Ralph Lauren, After Six and Many more! Proms, Weddings, Black Ties, Quinceanera, and Sweet Sixteen tuxedo rentals are our specialties. Restaurant and tuxedo apparel in stock! Welcome to DeLuxe Formal Wear...a part of your image! Deluxe Formal Wear Tuxedo Rental and Sales, headquartered in Clifton, New Jersey, is a fully operational formal wear company which is consistently stocked with the finest formal fashions available. We offer quality tuxedos and service at a competitive price! Our service representatives are courteous and accommodating! We have been in business at the same location in Clifton, NJ for over 88 years! For proms, weddings and any special occasions or events where you need to look your best, you can count on Deluxe Formal Wear. We serve the following areas in Northern New Jersey: tuxedo rentals Passaic County, tuxedo rentals Essex County, tuxedo rentals Bergen County, tuxedo rentals Hudson County and tuxedo rentals Morris County. We also service tuxedo rentals throughout North Bergen, NJ. 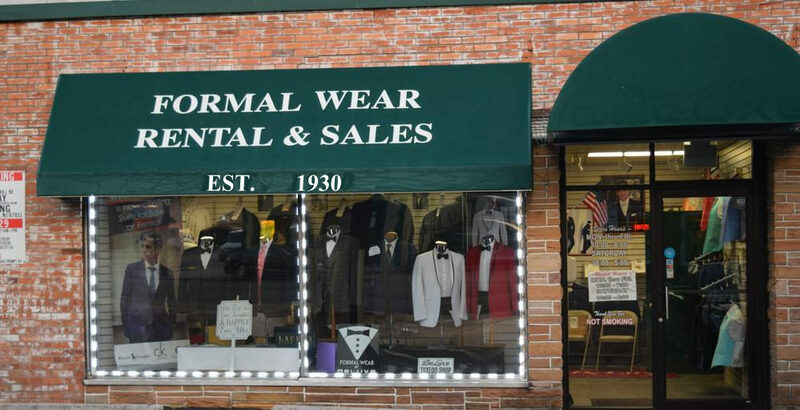 When it comes to tuxedo rentals, formal wear rentals and related accessories in and around the Northern New Jersey area, be sure to give Deluxe Formal Wear a call! At Deluxe Formal Wear located in Clifton NJ, we carry all tuxedos in stock from Ike Behar, Perry Ellis, Ike Behar Slim, Jean Yves, Ralph Lauren, After Six and Many more! Proms, Weddings, Black Ties, Quinceanera, and Sweet Sixteen tuxedo rentals are our specialties. Restaurant and tuxedo apparel in stock! Remember, if you’re drawn to our competition, with their nationwide advertising, and they try to fit you with a regular suit, please call us immediately for an appointment. All brands are cut differently so the one on the mannequin or off the rack will not fit you like the one you select from the book! At Deluxe Formal Wear, you are fitted in the actual tuxedo you will wear. No surprises on your big day!